Update: if you are interested I am mentioned in the online version of New York Times Diner’s Journal for making Rumtopf and on page D1 of the NYT print edition 9/22/2010. Family Traditions are important. They are the passed down knowledge of those who came before you, ancestors that may be gone but continue to live on in you. Family Traditions are a way for us to reconnect with our roots and to remember the loved ones who passed along those traditions. On my Mother’s side of the family we have a fair amount of German heritage. I remember in particular, my Great Grandpa Adams. One of my earliest memories of him was sitting together on my Mother’s back porch watching him roll his own cigarettes. Once he had finished rolling them, he had me “help” by licking the cigarette papers so he could seal up his freshly made smoke. However, my help was very short lived when my Great Grandma Adams got a glimpse of it and took to curtly scolding him in German. I didn’t understand what she was saying but I knew she was as mad as a hornet. Despite the language barriers, Great Grandpa Adams was able to teach me many things by showing me, and then letting me try to do it. This is always how it has been in my family. We don’t write it down, there is no fancy instruction manual. While there is no instruction manual, there is time, patience, showing and doing. It is about the teaching, the sharing and the learning. The learning of Family Traditions. Since my Cigarette Licking occupation was so short lived, I’m afraid I can not pass this valuable information along to you folks. But don’t be bummed, because what I can share with you is a recipe that has been passed down in my family for as long as I can remember, which for me is as far back as my Great Grandpa Adams who made Rumtopf. He passed that knowledge on to my Granda Lois, who passed on that knowledge to my Mother Bonnie who passed that knowledge on to me. Making me a 4th generation Rumtopfer. Rumtopf translated literally means “Rum Pot”. Rumtopf is also known by a couple different names such as, Bachelor’s Jam or Boozy Fruit, while a version using Brandy is sometimes called Tutti Frutti or Brandied Fruit. All versions are the same principle. It is basically sugared fruits, covered in alcohol and left to ferment and be enjoyed at the Holidays. It was a way to capture the flavors of summer and heat you up on the inside during the cold Winter months. This recipe will be coming to you in ratios, as everything will greatly depend on the type of storage vessel you are going to use. Traditionally, Rumtopf is made in a large 3-5 quart stoneware crock called a Rumtopf. You can make it in glass jars, but you will need to keep an eye on them and release the gases, by opening the jars, on a regular basis – otherwise left unchecked you could have an explosion and a rummy mess on your hands. 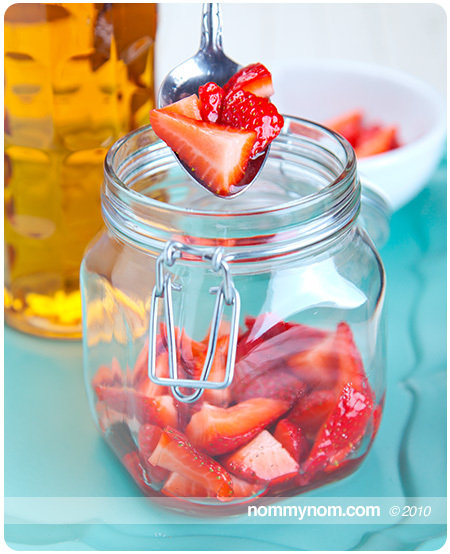 When using glass jars, you will need to cover the sides to keep the light out, which will discourage bacteria and mold growth while the fruit cures. A simple wrap of brown craft paper does the trick nicely, just make sure that you can get in to the jar to release that gas. You will also store your jar in a cool, dark place, a closet works nicely. Mix together and let it stand for 2 hours. 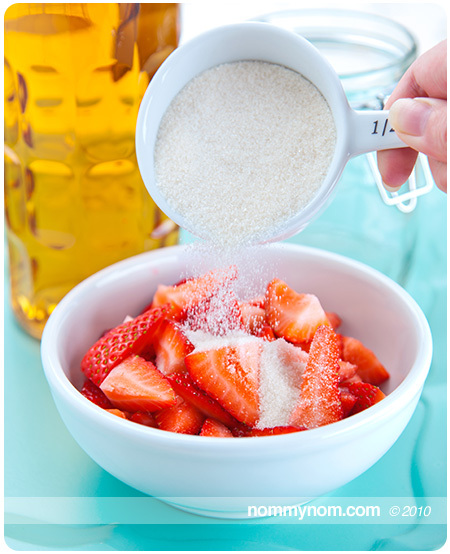 Take your sugar soaked fruit and spoon it into your jar. Pour enough Rum into the jar to cover the fruit, with 1/2″ excess. Sometimes the fruit will want to float to the top. It is very important that the fruit does not come into contact with the air. If it does it will mold and spoil. To prevent this you can use a small saucer to weigh down the fruit. I have a special trick that I developed for smaller sized jars, I take plastic lids from tubs of Cottage Cheese or Yogurt and trim them to fit the opening of my jar and drop it inside weighted down with a clean rock. Works like a charm at keeping the fruit submerged in their boozy bath. Rumtopf takes 9-12 weeks to properly cure. Start counting the time from your first layer of fruit. Store in a cool, dark place and check it often to release any gases and keep an eye on any possible spoilage. If you do happen to spot any molded fruits, remove them immediately. You will not have to throw out the liquid, just the spoiled fruits. 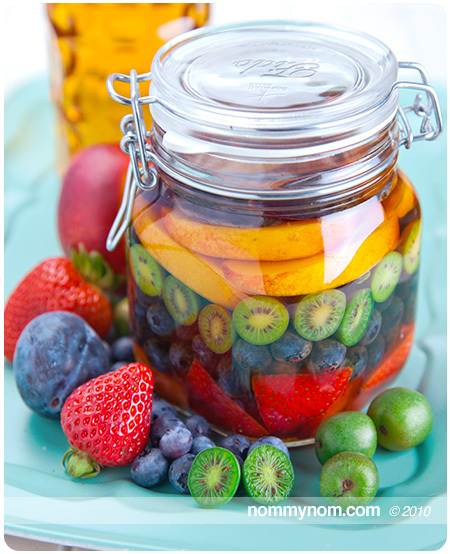 Repeat the step – “How to Assemble Rumtopf” with each new fruit, creating layers as you go. Some fruits will get mushy and/or discolored. This is perfectly normal and does not mean that you fruit is spoiled. Citrus fruits are not suited for Rumtopf. They add a very unpleasant bitterness to the mix and it will taint the entire batch. Bananas and Melons are not suited for Rumtopf as bananas are too mushy to begin with and melons contain too much water which will dilute the alcohol and sugar mixture and result in spoilage. Fruit from the Rumtopf is delicious on top of custard, pudding, ice cream or a slice of pound cake. Drained Fruit from the Rumtopf can be cooked and reduced down to thicken and used as a delectable “relish” that is exceptional with things like Quail, Pork, Duck & Game meats. The leftover Rum makes a delicious sweet and fruity cordial to sip on those long Winter nights when you are dreaming about the coming sweetness of Summer or to add to a homespun cocktail. This entry was posted in Recipes, Vegan & Vegetarian and tagged alcohol, bachelor's jam, boozy fruit, canning, cordial, cured, drunken fruit, food, gift idea, homemade gifts, how to make rumtopf, layered, liquer, liqueur, liquor, make at home, pickled, preserve, preserved, recipe, rum, rumtopf, tutti frutti. Bookmark the permalink. Thank you for the recipe! I just made my first Rumtopf this afternoon with strawberrys, cherries, pears and plums. I soaked the fruits in suger before hand, placed them in 32 ounce canning jars with a mixture of 151 and 40% rum where the fruit is completely under the rum. Two questiosn for you! 1. how often do I have to release the gases, and, 2. I have a bit of a pile of sugar at the bottom of the canning jar…how bad is this? I would very much appreciate your expert advice! Fantastic! It sounds like a great mix of goodies! About the sugar, I get a little pile at the bottom as well. The pile of sugar at the bottom, might be due to the fact that you added everything all at once, as opposed to throughout the season as each fruit becomes available (I’ve done it both ways and both ways are fine) since you have yours in canning jars (and I am assuming that you have tight fitting canning lids on them all here) you can just give the jars a little turn upside down after you release the gasses. Now on to releasing the gasses. The most activity in fermentation you are going to see is within the first 4-6 weeks. You will notice the fruit will bubble a bit and begin to discolor – which is perfectly fine and normal. I would releases gasses twice a week for the first 3 weeks then go to once a week until the first 6 weeks has passed. After that I would say that it is safe to leave it sit on the shelf. 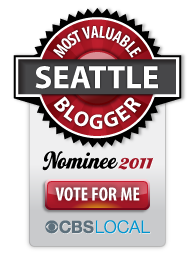 I still have one canning jar left from the day I put this post up – and I have not opened in in the past 6 months, it has been perfectly ok. The biggest issue is the initial fermentation, that is where the majority of the gasses are being released early on. In fact… I’d say you will be ready for a taste test in 6 weeks time ;) it does get better as it ages… thanks for letting me know you tried this and asking questions! Always happy to help, keep us all updated on how yours came out! Cheers! Kelly! You are spectacular! Thank you for answering my questions, so very much appreciated. My German mom used to make this when I was a kid, she has since passed, and of course now as an adult I wanted to try it! I do however have another question, or request for advice, if you don’t mind! You were correct, I did add all the fruit at once. Luckily, living in Southern California we have all these wonderful fruits available in May! I have some fruit that simply will not stay under the rum..any ideas what to put in a narrow canning jar to hold it down? My fruit has gotten..smaller in the jar? Or just softer, so there is more room in the jar. I bought some more fruit today to add. I’ve also heard about adding ascorbic acid. This may help prevent bacteria? Have you heard of this? Thank you again, I feel a bit like I am flying blind on this one! I certainly do not want to poison us. So appreciative of your post! My mom always had a big ceramic crock of ‘tipsy fruit’ going when I was a kid. The finished jars were kept in the fridge. It becomes a heavenly brown, gooey, thick fermented sauce for ice cream, cakes, cheesecake topping, and other sweet treats. Our friends were always amazed that my mom let us kids have such a potent treat! One technique I’ve used when making in jars vs crock – I cut out some cheesecloth & secure over the top of the jar with a rubberband, then place the lid on without screwing it on. The cheesecloth prevents flies & ants from getting in but releases any gasses. After the initial bubbling, take the cheesecloth off, & screw the lid on. A crock is much easier & more fun since you can keep adding in fruit for months. If you like this, it’s a worthwhile investment. I use the crock to trade off making sauerkraut, kimchee, and tipsy fruit depending on the season. btw — what is a ‘snap top canning jar’? Hi Tinuviel! Yes a Crock is absolutely ideal, and your tip about the cheesecloth is awesome! It does keep those pesky little suckers out of there. Your question about the “snap top canning jar” Those are the jars that have a typically glass lid, with a wire bar that goes over the top and another wire bar that you push down to get a seal on the jar. Dear Kelly, I was introduced to Rumptopf many years ago and never quite forgot the taste and this year decided to make one. I followed your instructions and although I did help submerge the fruit with a saucer, when adding the last fruits I must have forgotten to put it back in situ. It has been a couple of weeks and I brought it out of the pantry to check it. I noticed a few tiny, what I call fruit flies circulating and when I opened it, to my horror, I could see tiny, tiny little white worms in the top layers of fruit. I removed as much of this as possible but I am really concerned I may have to discard it. The smell from the jar is wonderful and it does not appear to be off! Do you think it would be safe to eat. Incidentally, I did cover my ceramic rumtopf jar with cling film, then placed the lid on top so nothing could get in, so perhaps they were there in the fruit already. Would be truly grateful if you have time to advise. Look forward to hearing from you. As always, when in doubt – throw it out. It is better to be safe than sorry. I don’t see any reason why you could not start one now, it will just not be ready in time for the Holiday Season, but you will have a nice bit of Rumptof ready to ring in Spring! This sounds like so much fun….thanks for all the useful information. I have several harsh crocks of various sizes for making kraut. I would assume this would be perfect for making rumtopf. My question is after the 9 to 12 weeks of fermentation, do you put it int the frig for keeping, or do you put it in canning jars…..just curious how you preserve after. I don’t think that our two person family could consume all in a short period of time…..thank you and keep sharing your recipes. Sorry one final question….as long as the fruit is in a dark sealed crock is it necessary to keep the fruit from floating to the top.? This might be a dumb question but here goes: there’s no mention of stirring fruit once it’s added. 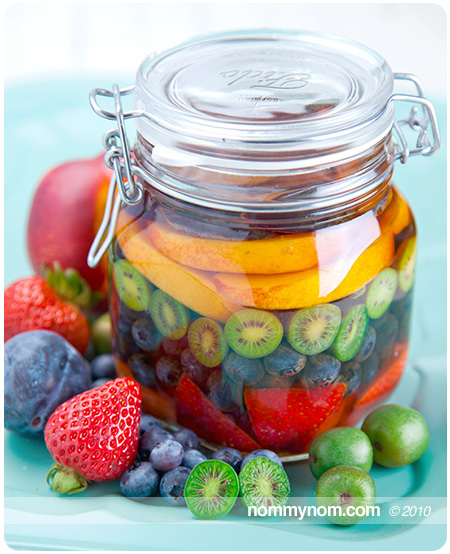 Do you just layer everything without disturbing the soaked fruit already in the jar? Or should you stir it as you add new fruit, etc. Or wait & stir it all up only when it’s time to enjoy it? I have an old rumtopf crock that I used 40 years ago when we were lucky enough to live in Germany and my memory is shaky on this point. You should always keep the fruit submerged, even if it is in a dark crock. What you are trying to do is to keep the fruit and the air from getting happy together and making mold. Keeping the fruit submerged keeps it preserved and keeps the air off of it so that it prevents molding. As for storage, yes, canning jars would work fine. I have actually portioned my Rumtopf out in to smaller canning jars and given them to family and friends with instructions to refrigerate, to be on the safe side, since once it goes in to the canning jars some edges of the fruit can become “uncovered” and exposed to the air. Keeping it in the fridge after putting it in to canning jars would keep it longer. I have never “canned” it with water bath or pressure canner – honestly I would be afraid to do a traditional canning method on it due to the danger of mixing high heat and alcohol in closed containers… just doesn’t feel like a smart idea to can it. But just putting it in a jar to give or to store it in the fridge (you can also put it in the freezer) is the way you want to go. Is it possible to use canned fruits? I’ve started a Rumtopf which has been going for about 4 weeks, it all seemed okay until last week. it seems to have a film on top bubble froth? is that from the fermentation or has it gone off? Can you do this in parts as you get seasonal fruits vs all at once? It is possible that some fruit or fruit fragments floated to the surface. I just splurged on a proper Fermenting Crock Pot with a water seal that I hope will deter pests and weighing stones to keep everything submerged. Should I use these weights to keep fruit from popping up to the surface or would the stones weigh the fruit to mush? You should be able to use the stones, you don’t need too much liquid over the top so just add enough that you can see there is no fruit exposed to air and you should be good. The fruits will squish over time on their own as they will leak out some of their own juices in to the liquor. Everything will go a sort of lovely caramel color with time, so don’t be alarmed by any browning you may see. You really just want to keep an eye out for mold or pests. And congrats on your new crock!!!! I filled a large German crock pot for Rumtopf about 6-8 weeks ago. It was full to the brim with fruit with the correct proportion of sugar and rum. It all seemed to be going fine, however I’ve just checked it – only to discover that at least half of the fruit has vanished, the rest is fine and not mushy. There is masses of strong, alcoholic juice and a load of sugar at the bottom. I’ve put the fruit that is there in three large jars, covered in alcoholic juice and am left with half a crock pot of juice with sugar at the bottom. Can I do anything else with all the juice apart from strain it and drink it over the next 10 years?! The fruits do sort of let out their liquid in to the alcohol, they will get a sort of pruney look to them, and that is perfectly ok! 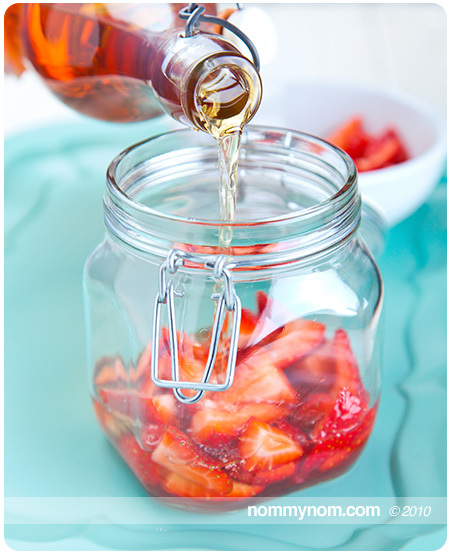 One of my favorite ways to use the excess alcoholic juice is to create a simple syrup (just 1 cup water to 1 cup sugar bring it to a boil) and then add in 1/4 to 1/2 cup depending on your taste to the simple syrup. Bottle it up and keep it in the fridge. It makes a decadent ice cream topping for adults or add it in to another cocktail or spritzer.